If you love Leahey’s Macaroni and Cheese and want their cheese sauce for your own dishes, then you’re in luck! 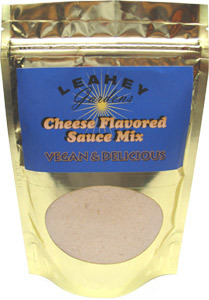 Leahey Gardens now makes their delicious vegan cheese sauce in a large 8 oz. package so that you can make a batch as you need it for your own recipes. 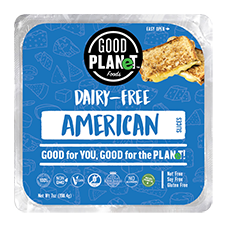 By far the creamiest, most flavorful vegan cheese sauce we’ve ever tried, once you sample this amazing sauce you’ll be hooked! 8 oz. (227g) package is $7.69. Ingredients: Yeast extract, unbleached flour (wheat flour, malted barley flour, niacin, iron, thiamin mononitrate, riboflavin, folic acid), sunflower oil, tomato powder, sugar (non-bone char), salt. From Melissa Banyas of ALBURTIS, Pennsylvania on 5/2/2017 . So happy to have tried the original sauce mix. It is a great addition to our kitchen. Quick, easy and delicious. Worth every penny. I tried it w/soy milk and water and both were great. From Anonymous of alexandria, Virginia on 10/22/2015 . I would buy this again. I used plain almond milk. Don't expect the well-remembered mac n cheese flavor, this is just a little different. But tasty in its own way. I added a little chipotle chili powder to give it a little umph. I added the sauce to some pasta of my choice. It's hardy and satisfying. From Cassandra of Madbury, New Hampshire on 10/7/2013 . One of my old comfort foods was Velveeta and macaroni, so I'm pleased to find a quick and easy substitute that tastes pretty good. It tastes more like cashew sauce than Velveeta, but the texture was nice and creamy. Plus, there are quite a few servings in the package! If you're trying to decide between this and Teese, definitely go with this. From Kristin of New Berlin, Wisconsin on 12/12/2012 . 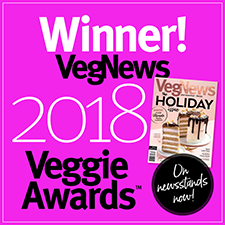 I've had plenty of boxed versions of vegan mac n cheese -- save your money for this, and simply add some macaroni or penne noodles. Not only will you save a couple bucks, but - more importantly - it's the closest thing to the real thing I've tasted. Also, a small personal quirk: I love that it's white, not orange, and am convinced that the flavor is more sharp white cheddar (which I prefer over the flavor of straight cheddar). From Alysa of Seattle, Washington on 11/23/2012 . I loved the Leahey Gardens mac and cheese mix, but it was a little too expensive to buy regularly. The powder by itself is an amazing deal, and as a college student with little time to cook, I'm able to make a super-quick meal that isn't expensive. When I'm making mac and cheese, I melt some margarine in the pot, and use a mixture of 1/2 c water, 1/2 c almond milk. Sprinkling Daiya in makes it amazing, and I also enjoy using paprika and a little cayenne for a different flavor. Only 1/3 cup of the powder is needed to make a huge batch of macaroni--it definitely goes a long way.